“Perpetrator Has Been Arrested, But Killer is Still at Large”: Calls Rise to Remove Confederate Flag | Democracy Now! president of the North Carolina NAACP and Moral Monday leader. He is author of the book Forward Together: A Moral Message for the Nation. Republican South Carolina state representative who has voiced support for taking down the Confederate flag from the front of the state Capitol. McCausland professor of American history at the University of South Carolina. His most recent book is The Cause of All Nations: An International History of the American Civil War. StoryJun 19, 2015South Carolina Massacre: Why Don’t We Call Killing of 9 Black Churchgoers an Act of Terrorism? AMY GOODMAN: Calls are growing in South Carolina to remove the Confederate battle flag at the state Capitol after last week’s mass shooting of nine African-American worshipers at the historic Emanuel AME Church. 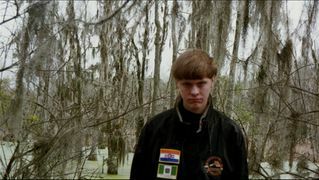 The flag has been the source of controversy for decades in South Carolina, but a growing number of politicians are calling for its removal after photos were published online showing the accused gunman, Dylann Roof, posing with the flag. On Monday, South Carolina Governor Nikki Haley called on lawmakers to take down the flag at the state Capitol grounds. That flag, while an integral part of our past, does not represent the future of our great state. The murderer now locked up in Charleston said hoped his actions would start a race war. We have an opportunity to show that not only was he wrong, but that just the opposite is happening. My hope is that by removing a symbol that divides us, we can move forward as a state in harmony, and we can honor the nine blessed souls who are now in heaven. AMY GOODMAN: South Carolina Governor Nikki Haley called on state lawmakers to address the issue over the summer, and said she would order a special session if they did not. Debate over the flag goes back decades. South Carolina raised the flag over the state House in the early ’60s at the height of the civil rights movement, a hundred years after the Civil War. The flag was moved to its current location on a lower flagpole on the Capitol grounds in 2000, when the NAACP launched a tourism boycott of the state. Last week, NAACP President Cornell William Brooks described the flag as an emblem of hate. CORNELL WILLIAM BROOKS: Some will assert that the Confederate flag is merely a symbol of years gone by, a symbol of heritage and not hate. But where we see that symbol lifted up as an emblem of hate, as a tool of hate, as an inspiration for hate, as an inspiration for violence, that symbol has to come down. That symbol must be removed from our state Capitol. AMY GOODMAN: While South Carolina has been the focus of attention this week for flying the Confederate battle flag on the grounds of the state Capitol, seven official state flags in the South still contain imagery from the Confederate flag—Alabama, Arkansas, Florida, Georgia, Mississippi, North Carolina and Tennessee. To talk more about the controversy, we’re joined by a number of guests: from Columbia, South Carolina, South Carolina State Representative Gary Clary and Don Doyle, professor of American history at the University of South Carolina; in Raleigh, North Carolina, Reverend Dr. William Barber joins us, president of the North Carolina NAACP. But we begin with Republican South Carolina State Representative Doug Brannon, who has announced plans to sponsor legislation to take down the Confederate flag from the front of the state Capitol. Brannon was a friend of the late state senator, Reverend Clementa Pinckney, who was killed in last week’s church massacre. State Representative Brannon joins us via Democracy Now! video stream from Spartanburg, South Carolina, from the district he represents. Welcome to Democracy Now! We’re going to begin with you, Republican South Carolina State Representative Doug Brannon. Tell us about your decision to introduce legislation to bring down that flag. REP. DOUG BRANNON: I woke up Thursday morning, last Thursday morning, to the news of the death of these nine wonderful people. I knew something—I felt something had to be done then. It took a few hours to figure out exactly what, but what really prompted my desire to file the bill was when I saw the photos of the front of that automobile and the photos of the T-shirt and then, later in the day, of that shooter carrying a flag. Clementa Pinckney deserves this. Those nine people deserve this. Our state Capitol needs to be free of the flag. AMY GOODMAN: How long have you been in office? REP. DOUG BRANNON: Five years. AMY GOODMAN: Had you ever had a desire to do this before? Had you ever spoken with Clem Pinckney about his desire to have this removed? REP. DOUG BRANNON: No, Senator Pinckney and I had not talked about the flag specifically. We did talk about other issues, and we talked about judicial candidates and those types of conversations, aside from just friendly conversations. But he and I never talked specifically about the flag, no. I think your other question was, had I ever thought about it before? And as I’ve said to others, no, and I apologize for that. I should have done it five years ago. That’s what public officials are supposed to do, is the right thing. I didn’t do it. And for that, I apologize. AMY GOODMAN: What was your reaction to seeing Governor Nikki Haley say, for the first time, that it should come down? REP. DOUG BRANNON: Pure joy. But it wasn’t—I’m thankful for the governor’s remarks and demands, but to see those standing near her—you know, Senator Graham, Senator Scott, members of both bodies, the House and the Senate—the movement, the current has picked up. It’s moving quickly. And I believe the votes are there. AMY GOODMAN: Do you believe you could lose your next election for introducing this legislation? REP. DOUG BRANNON: Well, I’ve been up since 4:30 this morning. I was watching the local news in Spartanburg, and they were conducting a poll. And if it’s accurate, I will lose, because it was about 70/30 in favor of leaving the flag on the state Capitol grounds. So if that poll is correct, I’m in my last term. AMY GOODMAN: So, is it making you reconsider? REP. DOUG BRANNON: Absolutely not. I’ve said over and over again I’m going to do my job until I lose my job. In my heart, I know this is the right thing. AMY GOODMAN: We’re also joined by your fellow state representative, Gary Clary. Can you talk about your thoughts on the day that the massacre took place at Mother Emanuel, at the Emanuel AME Church in Charleston? REP. GARY CLARY: Well, I had similar feelings as my colleague, Doug Brannon, did—just utter disbelief of what has transpired in Charleston. And, you know, we lost a friend and a colleague in Senator Pinckney, and then those eight other souls that perished that night. And certainly, when I look at my career, a very short one here in the General Assembly, I knew that something had to be done. And I talked to my friend, Doug Brannon, and he talked about the political realities of what we’re about. But, you know, when I ran for election last year, I asked the people in my district to vote for me if they wanted to send a reasonable and sensible person to Columbia. And I believe that the vote that they gave me was resounding. And as a result, I know that I’m doing the right thing, because we need to end—end this part of our history. And when I say “end” it, we need to remove this flag from the state House grounds and put it in a proper place. We need to put it in the state museum, in the Confederate relic room, where it justifiably belongs, but not on the front door of the state House grounds. You know, there’s a fence around that flag that was moved in 2000, and I think it’s very significant that the fence is there. I believe that fences are put up to keep people out. And what we need to be doing here in South Carolina is building bridges and tearing down those fences. AMY GOODMAN: We’re also joined by the Reverend Dr. William Barber from Raleigh, North Carolina. Reverend Barber, where were you when you heard that Clem Pinckney, Reverend Pinckney, State Senator Pinckney, and eight others were killed in this massacre at the church in Charleston? REV. WILLIAM BARBER: Well, we were actually in jail. About 10 of us had been arrested in the state House in North Carolina for challenging extremist politicians who have passed the worst voter suppression law in the country. In fact, parts of it were worse than South Carolina. We were arrested for merely speaking up; they told us that we could not exercise our First Amendment right. And we found out about it actually in jail. REV. WILLIAM BARBER: Well, I have a lot of mixed emotions. You know, I’ve said that the perpetrator has been arrested, but the killer is still at large. And historically, what causes this kind of terroristic violence is when you have racialized political rhetoric and racialized policies. They become the spawning ground, the birthing ground, if you will, for terroristic violence and violent resistance. The flag, for instance, in South Carolina was put up and began to be waved more after the 1954 Brown decision and then in 1962 at the height of the civil rights movement. So the flag was put up as a resistance to policy. Dr. King called it interposition and nullification. It was a sign of that. I’m glad to hear those two representatives say what they’ve said about this, but I also heard the governor say that it will always be a part of the soil of South Carolina. Now, soil is something you grow from. Reverend Pinckney, as a colleague in ministry, was not just opposed to the flag, he was opposed to the denial of Medicaid expansion, where now the majority of the state is opposing Medicaid expansion where six out of 10 black people live. He was opposed to voter suppression, voter ID in South Carolina. He was opposed to those who have celebrated the ending of the Voting Rights Act, or the gutting of Section 4, which means South Carolina is no longer a preclearance state, and the very district that he served in is vulnerable right now. He was opposed to the lack of funding for public education. He wanted to see living wages raised. So I would say to my colleagues, let’s take down the flag—to the governor—but also, let’s put together an omnibus bill in the name of the nine martyrs. And all of the things Reverend Pinckney was standing for, if we say we love him and his colleagues, let’s put all of those things in a one big omnibus bill and pass that and bring it to the funeral on Friday or Saturday, saying we will expand Medicaid to help not only black people, but poor white Southerners in South Carolina, because it’s not just the flag. Lee Atwater talked about the Southern strategy, where policy was used as a way to divide us. And if we want harmony, we have to talk about racism, not just in terms of symbol, but in the substance of policies. The flag went up to fight policies. If we’re going to bring it down, we’re also going to have to change policies, and particularly policies that create disparate impact on black, brown and poor white people. AMY GOODMAN: Doug Brannon, a state representative from South Carolina, a Republican state representative, your thoughts as you listen to the Reverend William Barber? REP. DOUG BRANNON: We’ve never met. I would like the opportunity. I am a Republican member. Five years ago, I fought a bill that would have torn apart public education in South Carolina. I understand that there is much change that needs to take place in the state of South Carolina, but this flag is where we’re starting. I’m not willing to spread—we’ve got focus on the flag, and that’s where it needs to stay right now. I respect everything the gentleman said. I can’t say I agree with everything he said, but I can tell you that we’ve got movement here, and I’m going to keep my focus on this issue right now. And when we address this issue properly, we’ll move to the next. AMY GOODMAN: Representative Gary Clary, you’re dealing with these issues in the Legislature—for example, one of the issues that State Senator Clem Pinckney focused on, Medicaid expansion. Your thoughts about this? REP. GARY CLARY: Well, you know, Medicaid expansion was something that was debated during the last session of the General Assembly. And our governor, Governor Haley, made the decision that she would not accept federal funds for Medicaid expansion. And, you know, certainly, I hear what Reverend Barber has had to say, and that is something that is going to have to be examined in the future. I agree with Doug Brannon from the standpoint we’re up against the clock right now because our session actually ended on June 4th, and we’re operating under a sine die resolution. And I think that that sine die resolution will probably be—there will be an attempt to amend that today to deal with this flag issue. And that is something—I agree with Doug—that we need to focus on right now, because if we can pay tribute to Senator Pinckney and those other eight that lost their lives last week, then that would be a major achievement for us in being able to remove the flag from the state House grounds and then start taking the next step insofar as dealing with some of the problems that Reverend Barber expressed. AMY GOODMAN: You know, there is a Confederate monument that was built to be with the flag in front of the state Capitol. Is there any discussion, Doug Brannon, of moving that to a museum, as well? And is there any discussion of possibly having a monument to the nine martyrs or to your fellow state representative—actually, a state senator, Clementa Pinckney? REP. DOUG BRANNON: I have not heard any comment or mention of removal of the actual Confederate memorial. I would remind everyone that there are several different memorials around the state Capitol. It’s actually—except for the one, the flag that we’re talking about today, the state Capitol is a beautiful area with monuments and memorials to many individuals and groups of people. As far as a monument to the nine who were murdered last Wednesday, I have not heard any mention of a specific memorial for them, either. But that, I would suggest, is a wonderful idea. AMY GOODMAN: Well, we’re going to break and then come back to this discussion. We are joined by two South Carolina state representatives, both Republican, Doug Brannon and Gary Clary. Both say they will support, Doug Brannon says he’ll introduce, the bill to bring down that flag. Reverend Dr. William Barber is with us from Raleigh, North Carolina. We’re going to be speaking with the South Carolina Don Doyle—a historian, Don Doyle, about the significance of the Confederate flag. And we’ll soon be joined by David Goodman, who is the brother of Andrew Goodman. Andrew Goodman, James Chaney and Mickey Schwerner were [three] civil rights activists who in the early 1960s went to Mississippi to deal with an attack on a church, a black church, a church that was burned down. As they left that church, they ultimately were murdered. And we’re going to talk about the significance of this 51st anniversary of their deaths. It was, oh, June 21st, 1964. Stay with us. AMY GOODMAN: This is Democracy Now!, democracynow.org, The War and Peace Report. I’m Amy Goodman, as we turn to comments made last year by South Carolina Republican Governor Nikki Haley. She suggested South Carolina had resolved its image problem and that having the Confederate flag at the state House was fine because not a single CEO had complained. She was speaking at a gubernatorial debate. GOV. NIKKI HALEY: The Confederate flag is a very sensitive issue. And what I can tell you is, over the last three-and-a-half years, I spend a lot of my days on the phones with CEOs and recruiting jobs to this state. I can honestly say I have not had one conversation with a single CEO about the Confederate flag. What is important here is that we look at the fact that, yes, perception of South Carolina matters. That’s why we have everybody answering the phones, “It’s a great day in South Carolina.” That’s why we’re being named the friendliest state and the most patriotic state and getting all these great accolades. But we really kind of fixed all that when you elected the first Indian-American female governor, when we appointed the first African-American U.S. senator. AMY GOODMAN: I’m wondering what is the response of corporations right now—for example, Doug Brannon, Boeing that’s there. Wal-Mart has just announced they’re removing all Confederate paraphernalia from their shelves. And are they going to bring pressure on the legislators to vote this way against the flag? REP. DOUG BRANNON: Well, I can tell you that several local Chambers of Commerce have demanded the flag come down. I believe the state chamber made the same request late yesterday. Obviously, I can’t speak for Boeing or BMW. They’re both wonderful contributions and corporations that contribute mightily to our economy. But, I mean, the movement is now. The business community understands what the flag means to a vast or a large percentage of our population. And I just—I’m amazed at how things have changed from Thursday afternoon to yesterday afternoon. It’s just incredible. And I believe the business community has much to be praised for the change in the temperature on this issue. AMY GOODMAN: Reverend Dr. William Barber, the issue of guns that President Obama raised right after the massacre went right to this issue. This was the 14th time he came before the American people talking about massacres that had taken place that, he said, are unique to the United states. And he says it’s about guns and gun control. REV. WILLIAM BARBER: Well, you know, and I want to step back and answer one other question, but let me answer in light of that. Again, policy. When I was in jail that night for opposing voter suppression, our Legislature actually passed a law in North Carolina easing gun restrictions and gun control, making it easier for people to get guns even if they were not cleared in terms of their mental records. That was passed at night, about an hour or so. Now, I know, and I’ve studied—I know my good friend, Dr. Lonnie Randolph, that Reverend Pinckney was also working for gun control and putting more gun control and working against things like police brutality. This is what I mean. This flag is vulgar. And it took 52 years, after '62, to get it down. It was raised because of policy. In civil rights, when Shwerner, Chaney and—excuse me, when the girls were burned up and blown up in the Birmingham [church], and President Kennedy was killed, we got the Civil Rights Act, an omnibus bill to deal with civil rights. When Jimmie Lee Jackson and others were killed in Bloody Sunday, we got the Voting Rights Act—Schwerner, Chaney and Goodman. When Dr. King was killed, we got the Fair Housing Act, that made it so you could sue people if they didn't allow you in their community. To suggest that nine lives and taking a symbol down is sufficient to honor nine deaths, nine—nine, nine deaths—is to diminish those lives. What I’m saying to our brothers and sisters, brothers who are on the phone this morning, is look at what Reverend Pinckney stood for and those members at Emanuel fought for. They fought for more gun control. They fought for Medicaid expansion. They fought for public education. They fought to raise the living wage to—the minimum wage to a living wage. By the way, you deny Medicaid expansion, people die. People die. You deny living wages and create poverty and resegregate the public, people die. That’s been proven in a study by the Columbia University. And so, what I’m suggesting, Amy, is we ought to look at all of these issues. We ought to—and we can’t say the flag is just a start and this honors them. It does not fully honor these deaths. And if we’re going to start and then wait and then politicize and be political—Lee Atwater said, in an infamous radio interview, he said that we stopped talking about race in a very open way, using the N-word, and we started talking about policies like tax cuts, states’ rights, forced busing. He said they sound benign, but they actually have a negative impact on the lives of African Americans, and they promote this idea that Southern whites—the problem of Southern whites is rooted in the advances of black people. That’s what this young man was, in essence, saying. He was, in essence, saying, you know, somebody’s taking over his country. And so, I’m calling on persons, Democrats and Republicans—we’re calling the NAACP—if you really want to honor the death, these vicious deaths, then, like we’ve had to do with other deaths in this country, let’s have some substantive policy change. Why not name the Voting Rights Restoration Act, since the Supreme Court has gutted it and we haven’t fixed that in two years, why not name it the Emanuel Nine Voting Rights Act Restoration? And why not every Republican and Democrat come out and say, “We are for fixing the Voting Rights Act, because without preclearance, the very seat that Reverend Pinckney held is in jeopardy”? Those are the kinds of substantive conversations we need to have. And gun control ought to be among those, as well. And we can do this in an omnibus way. We don’t have to wait another year or two years. We just have to have the moral courage to do it, and we have to follow what the Constitution of South Carolina already says. It’s already in the South Carolina Constitution that we should be concerned about life, liberty and the pursuit of happiness and doing what is best for all of the people. AMY GOODMAN: I want to turn to comments made by President Obama during his interview with Marc Maron for the WTF podcast. He talked about the power of the NRA lobby and the role the American public can play in altering gun laws. PRESIDENT BARACK OBAMA: Unfortunately, the grip of the NRA on Congress is extremely strong. I don’t foresee any legislative action being taken in this Congress, and I don’t foresee any real action being taken—until the American public feels a sufficient sense of urgency and they say to themselves, “This is not normal. This is something that we can change, and we’re going to change it.” And if you don’t have that kind of public and voter pressure, then it’s not going to change from the inside. AMY GOODMAN: President Obama also spoke about his reaction to the Sandy Hook tragedy, when a gunman killed—which killed 26 people on December 24th, 2012. PRESIDENT BARACK OBAMA: —gun sales shot up. MARC MARON: Yeah, because they panicked. PRESIDENT BARACK OBAMA: And ammunition shot up. And each time that these events occur, ironically, gun manufacturers make out like bandits, and partly because of this fear that’s churned up that, you know, the federal government and black helicopters are all coming to get your guns. And part of my argument is that, you know, it is important for folks to understand how hunting and sportsmanship around firearms is really important to a lot of people, and it’s part of how they grew up, part of the bonding they had with their dad. PRESIDENT BARACK OBAMA: It evokes all kinds of memories and traditions. And I think you have to be respectful of that. The question is just, is there a way of accommodating that legitimate set of traditions with some commonsense stuff that prevents a 21-year-old, who is angry about something or confused about something or is racist or is deranged, from going into a gun store and suddenly is packing and can do enormous harm? AMY GOODMAN: That’s President Obama speaking to Marc Maron on the WTF podcast. Doug Brannon, South Carolina state representative, what about that? What about the issue of gun control? REP. DOUG BRANNON: Well, I would ask the people around the country to look at South Carolina gun control. Just in the past two years, I believe, we have passed full background checks before one can purchase a weapon, and we have included in the law that if one has ever been deemed incompetent, that they can no longer legally possess a firearm. So, President Obama has called for background checks and mental health checks on a nationwide level, on a national level. We’ve done that here in South Carolina. So, from a gun control standpoint, I believe South Carolina is ahead of the curve there. AMY GOODMAN: We are going to turn right now to Don Doyle, a South Carolina historian, talking about the significance of the flag, McCausland professor of American history at University of South Carolina, his most recent book, The Cause of All Nations: An International History of the American Civil War. If you can briefly talk about the significance of why this flag went up on top of the state Capitol, not in—not a hundred years ago, but actually at the height of the civil rights movement, and its significance now, what you’re seeing unfold in these days? DON DOYLE: Yes, thank you, Amy, for having me this morning. The history of this flag—keep in mind, first of all, that this is not the Confederate flag. It’s the battle flag of the Army of Northern Virginia, Robert E. Lee’s major army, not just for Virginia, but for the Eastern Theater. And it was a symbol of rebellion, rebellion in 1860, ’61, against the electoral victory of the Republican administration under Lincoln. And it was a rebellion to secede and to overthrow the power of the federal government within the what became 11 Confederate states. So, a century later, that flag then became, or had been, a symbol of a second rebellion, and that was a rebellion against desegregation and federal efforts to interfere in the states’ rights to perpetuate segregation. It goes back not to 1962, but earlier to at least in 1948, when Strom Thurmond of South Carolina, U.S. senator, led the Dixiecrats out of the Democratic Party, protesting the civil rights plank that was included that year in the Democratic Party platform. And it continued to become a symbol. Now it was politicized and became a symbol of resistance to desegregation in 1961, 1962. This was a time when the—when Clemson was about to be desegregated, with Harvey Gantt applying for admission, James Meredith in Mississippi. And not just South Carolina, but nearly all of the Deep South states began to use the Confederate flag as a kind of symbol of resistance. Now, it was also entangled with the commemoration of the Civil War centennial of a century earlier. So it was confused and shrouded in this issue of heritage and history and this kind of benign concept of celebrating or honoring the past. And I think people very sincerely believe in that, but at the same time, the political implications of the flag in 1962, when it was raised on the state House dome along with the United States flag, the state flag and then this battle flag, I think it was clear to everyone that this was a symbol of resistance, of defiance, and that if it provoked and offended, I think that was OK with the people who defended the place of that flag up on the state House dome. AMY GOODMAN: We’re going to break, come back to this discussion. That is historian Don Doyle of the University of South Carolina. We’re talking to Reverend Dr. William Barber up in Raleigh, North Carolina. And we’re talking to Gary Clary and Doug Brannon, both Republican South Carolina state representatives. Both say they will support an amendment that Doug Brannon will introduce to bring down the flag, the Confederate battle flag that now—used to be on top of the Capitol but was moved to the front yard of the South Carolina Capitol in Columbia, South Carolina. When we come back, we’ll also be joined by David Goodman to talk about the anniversary of the death of his brother, Andrew Goodman. Sunday was the 51st anniversary of the killing of these three young civil rights workers who had just left a burned black church in Mississippi. Stay with us.